“Danger, danger, Will Robinson!” Oh, how I loved this show when I was a kid! It sparked my imagination and gave me a taste for science fiction, adventure, space and fantasy that I still enjoy today. We have all three seasons on DVD, and I enjoyed re-watching them with my boys when they were younger. Of course, the Lost in Space Robot was one of the main attractions of the show, along with the adventurous Will and the villainous Dr. Smith. My boys still have a toy version of the Robot, but now B9Creations has announced the production and sale of Full Size, Limited Edition, Fully Licensed Replicas of the famous Lost in Space Robot. They have really gone all out to make these as authentic-looking as possible. The parts are all based on the original molds. You can activate the Robot by remote control. Functions include turning the Robot’s torso left/right, directing the Robot’s voice to respond “Affirmative/Negative” and activating the Robot’s soil sampling sequence. The Robot also comes with over 500 voice tracks by Richard Tufeld, the voice of the original Robot. And here is a neat feature: it has a functional power pack. Pulling the Robot’s “power pack” will shut down the Robot with the “Aaghhhhhh…” sound, just as it did in the TV series. However, with a price tag of $24,500 I won’t be buying one of these anytime soon. At least the price includes shipping! US$25,000.00! You’d have to be a “Nickle-plated Ninny” to pay that much. (Wish I had the money!) But for that price I’d want to be able to get inside and operate it just like they did for the show. Great story! Jack – “Nickle-plated Ninny!” I love it! I can tell you are a true Lost in Space fan. And yes, it would be fun to actually be able to get inside one of these things. Thanks for commenting! Sir. I admire your work(what I’ve seen of it)but it leads me to ask, what else ya got? He would make an excellent starting point to ad to. The possibilities are endless. But the Proteus bots would, in my opinion fit the bill better. So, what else Ya got??? I have to tell you that I salivate over those robots. I was and still am a big Lost in Space fan. The robot was my fav. I acutally tried to build one when I was 8. I would head out right now to knock over a bank to buy one…but due to the financial crisis we are in, the banks don’t have any money either! Skip – I am still a big Lost in Space fan, too. I had a lot of fun sharing this show with my kids when they were younger. Good thing the banks are out of cash; I wouldn’t want you to get into any trouble! sOULS I hit owerball,megabucks…I’ll order one….I do have one question,in two parts…. 1-A: would it be possible to modify it/him to run on dc-battery power-as did the robot in thr original series? I read that yrs ago in a interview with Bob May-(R.I.P.) that in order to safeguard against electical shock…the hero suit was set up to run either via chorded or battery. I suppose it’s possible, but….wireless R/C control..? that’d be cool! Sean – Never heard about the electrical shock bit. A remote control would be fun. I have to say you did it so what else does the robot do besides	just direct answers? There are a lot of people who remember the show and would love a chance to WIN one of these. Ever think B9 creations might raffle one off? $20 or so a chance? When they get to the 25K list price they select a winner. I’d give it a shot! Sir I am very impressed B9 looks like the original and would be an awesome machine to actually own. I grew up watching, loving and still enjoy the show to this day. I really wish that I could afford one Im searching for the complete series box set. I scrutinized a few still shots from the 1st season-Island in the sky,when Giants walked the earth,the angry sea. & I noted the legs DO NOT look like they do on lte pix or the replicas. The walking shot just outside the ship,getting the enviroment samples/estimates clearly shows different leg design… still the replicas are Soooo damn cool! As for articulating the arms,that can be done via a small windshield washer motor,a servo-gear,2-or-4 telescoping push rods. the tread section is easier…all that is needed is a drive system,wheels from a electric scooter chair ( & a seperate batery of course )OR A KIDS POWER WHEELS RIDING TOY ( re-inforced to handle te energy load/weight & r/c components ) I’d seel a city block for replica & all the parts needed to do that…BUT,I don’t see that happening in this century ( unless I hit the lottery-then u’d be getting a call…!). KEEP UP THE GOOD WORK. $24000 is a mighty hefty price – almost double the price of your average motor vehicle. I’d love it if you could make these more affordable – … I’d buy one at half the price. So what do you say … ??? Hi.and how are you.doing.tonight.well I am doing.fine.i want to know about my favorite robot b9.do you have the book to the robot and the templates.and the pictures to the robot too.and if you do I want you to send them three items to my address and my address is 551 Thurmond street northwest apt # 3 atlanta, Georgia 30314.okay.and whatever you do.please.dont forget about me.okay.and thank you so much.okay.and much my love goes out to you guys for making me so happy.okay.and I had almost forgot to give you my email address and it is adriennesteward50@yahoo.com.okay. Was curious if you still have any of the B9 robots for sale. What a wonderful reproduction, the best. Hello.I know that you don’t know me but my name is Adrienne steward and I wish that I can buy my favorite robot b9.and I love him so much.and he is my favorite robot.and I do dream about my favorite robot b9. I would love to buy one do you have installment plan? I’ve read that Legendary Pictures is developing a new TV series that will be launched in 2018. I sure hope they get input from the fans that grew up with the original series. If they don’t the new series might end up being a bust. I think the 1st of the 3 television seasons was consistently the best of the three. There were also some great episodes in the 3rd year like “Visit to a Hostile Planet” and “The Anti-Matter Man”. My hope is they make the series a true family show that I can watch with my eight year old. Ron – I agree, the first season was the strongest with some solid science fiction stories. “Anti-Matter Man” is a classic from season three. A very good friend of mine ( Alan Petsche)bought one of these robots years ago and we were organizing a 60th birthday party for him. His wife Bonnie and the organizer wanted the robot moved to the Texas Rangers Ballpark here in Arlington, TX for the party. I pleaded with the organizer not to, well the top third after being separated was dropped and broke the dome and a couple of other pieces. I have known Alan for 40= years and my heart sank when this happened. Is there any way to fix this problem ? Rick – I wish I did! Are the full-size Lost in Space robots still for sale? David – I don’t know. I wasn’t selling them, just thought it was neat that somebody was. Matt – Ha! I’m not selling them. I wouldn’t buy one at that price either. I have one of these for sale. In 100% working condition. Robot is in MINT CONDITION. Awesome Robot. Contact me if interested. Hi, I’m interested in the robot. Please let me know the details. Thank you!!! Hi Ray hope all is well would you know where I can buy one? For that kinda money I hope he also walk? Hey Ray I know you’ve been asked this question 1 million times however do you have any B9 robots for sale? 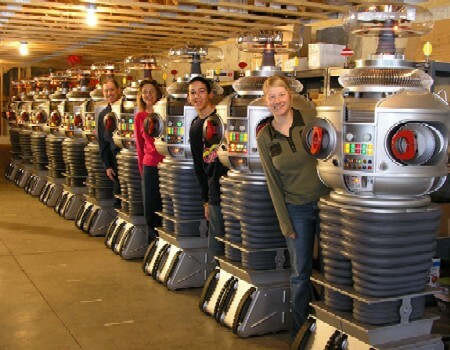 Hey everyone, thanks for asking about the full-scale Lost in Space robots. They are super cool, but I’m not the one selling them. I just linked to the article because I am a big Lost in Space fan from when I was a kid.